For those looking for effective and gentle pain relief along with improvement of function, Chiropractic care is now considered one of your best options. Essentially meaning “done by hand”, Chiropractic care is a safe, non-pharmaceutical approach to musculoskeletal health and wellness. Once considered fringe medicine, it has now become mainstream. In fact, the American College of Physicians reported in 2017 that Chiropractic care, along with massage and acupuncture, be the first-line defense against back pain. Our patients range from teenagers to the elderly, sports injuries to poor posture at the desk ‘injuries’, expectant mothers, acute and chronic pain, and cases that have failed therapy elsewhere. Treatment addresses incorrect alignment and inadequate movement patterns in spinal and extremity joints and in doing so, alleviates pain and increases joint performance. Patients feel ‘lighter’ and ‘looser’ after their visit. Effective not only for the spine, Chiropractic care can be used to treat the extremities as well. 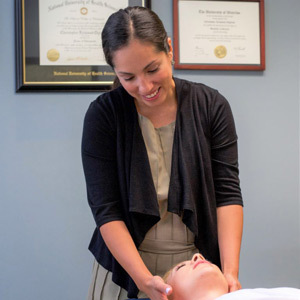 At the American Back Center we often use a combined approach – integrating corrective home-exercises, massage therapy and acupuncture – for maximum results. I have been receiving chiropractic care at the American Back Center for a year and a half , first because of a disk injury and then receiving maintenance through endurance sports training. The level of care has always been the very best and the staff is accommodating & friendly. I recommended the American Back Center to anyone looking for chiropractic care, especially in the Loop area. I’ve been coming here for about 4 months and they are THE best chiropractic office in the city. If you’re searching for a great chiropractor coupled with a comfortable experience, look no further than The American Back Center! !